Downhill Skiers Are Fast... But How Fast? On Sunday, the men's Olympic downhill race will be contested over a fast and challenging 3,300 meter course in Sestriere, Italy. The downhill is essentially a race of raw speed rather than technique. But just what is the top speed during a championship downhill race? Downhill Skiers Are Fast... But How Fast? 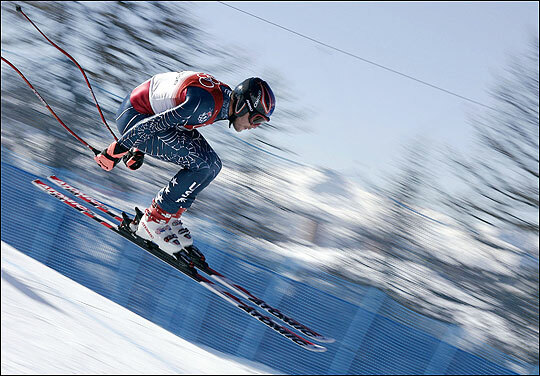 Bode Miller of the United States skis during the Men's Downhill training. How fast do you think he's going? On Sunday, the men's Olympic downhill race will be contested over a fast and challenging 3,300 meter course in Sestriere, Italy. The downhill is essentially a race of raw speed rather than technique. But just what is the top speed during a championship downhill race? Surprisingly, there's no media consensus about that. In a series on the Ten Hardest Things To Do in Sports, USA Today writes that downhillers reach top speeds of up to 80 miles per hour. The Columbus Dispatch says the race at the Olympics will be decided at speeds in excess of 80 miles per hour. The International Herald Tribune notes that during a downhill race Austrian star Hermann Maier controls his ski edges at up to 90 miles per hour. But in the Sports Illustrated Winter Olympics preview issue, the magazine says downhillers max out at a much more modest 50 miles per hour. The Encyclopaedia Britannica reports the average winning speed is 40 to 50 miles per hour, but it says nothing about top speeds. To get a straight answer I called David Currier, a former Olympic downhiller who lives in Boulder, Colo. He raced in the downhill and giant slalom for the U.S. during the 1972 Winter Olympics in Sapporo. "We had top speeds over 93 miles per hour when I competed," he says. "They haven't gotten much faster since then." Speeds are tracked by a radar gun set up at the fastest section of the downhill run. According to Currier, there is one stretch on almost every course where racers reach 85 miles per hour or more. That will be right near the top of the course at Sestriere, he says. Will we see the fastest downhill speed ever during the Olympic downhill? Probably not, says Currier. The top recorded speed during a downhill competition is 96.6 miles per hour, according to Currier. It was attained in January by Klaus Kroell of Austria on the classic Lauberhorn course in Wengen, Switzerland. But Kroell wasn't the fastest one down to the bottom. He finished 19th.